Equipped with a 6.2-inch Super IPS display, 19:9 aspect ratio, Snapdragon 845 SoC, Dual camera setup and 3300mAh battery. Freebie with Free Type-C USB Cable and Bumper Case. Warranty 1-year official Asus warranty in the Philippines What's in the Box? The lowest price of ASUS ZenFone 5Z (ZS620KL) is P26,995 at gigahertz, which is 27% less than the cost of ZenFone 5Z (ZS620KL) at TOMTOP (P37,213.56). This smartphone is available in 64GB, 128GB, 256GB storage variants. 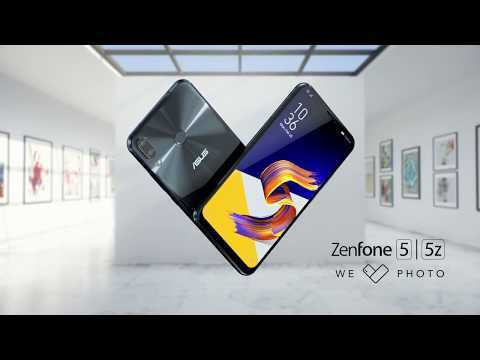 The latest price of ASUS ZenFone 5Z (ZS620KL) was updated on Apr 19, 2019, 09:16. ASUS ZenFone 5Z is one of the ASUS smartphone included in the ZenFone lineup having ultraslim bezels. It is an exciting smartphone perfect for today's generation and has extreme performance that harnesses the power of artificial intelligence (AI). The ASUS ZenFone 5Z is completely identical to the ZenFone 5 as they have the same appearance. The front and the back of the phone are covered with curved glass with a nice velvety coating and even though it can easily be covered with fingerprints, you won't have to worry as it can be easily wiped off. It has a smooth and rounded side that's why it felt very comfortable in hand. At the bottom edge of the phone sits the USB Type-C port, headphone jack, microphone and one of the two speakers. At the phone's rear has an ASUS typical pattern along with a camera module configuration and the fingerprint scanner. The phone has an aluminum frame that blends smoothly into the design. This phone has no IP56/68 rating that's why it's not water and dust proof. The ZenFone 5Z has 153 x 75.65 x 7.85 dimension and weighs 155g. It will be sold in Meteor Silver and Midnight Blue colors. The ZenFone 5Z sports a 6.2-inch display with FHD + 1080 x 2280 resolution and offers a 19:9 aspect ratio rather than the standard 18:9 aspect ratio that other Android phones offer today. Its screen covers almost 90 percent of the display because of the ultrathin bezels. The edge below the display is slightly thicker because it sits the loudspeakers, headphone jack, and USB Type-C port while on the top part of the phone looks like an iPhone X styled notch. And as stated by ASUS, the ZenFone 5Z uses Intelligent Display Technology which has the capability to use sensors to adjust the color temperature automatically and prevents the screen from shutting off when the user's face is recognized. The ASUS ZenFone 5Z has a dual-camera setup which has a 12MP with an f/1.8 aperture shooter and a Sony IMX 363 processor. The second camera is a standard 8MP shooter with 120-degree viewing angle. There's also 3-xis optical image stabilization and Dual-Pixel AF on board. The ZenFone 5Z can also record 4K footage at 30 frames per second. As for the selfie camera, it comes with an 8MP sensor. ZenFone 5Z's camera works well even in low light conditions. ASUS ZenFone 5Z runs with Android 8.0 Oreo and its own ZenUI 5.0 on top. It runs fast and can easily be adapted to. The ASUS ZenFones is not part of the Android One platform but they are planning to release an update for Android 9 devices soon. The ASUS ZenFone 5Z is equipped with Qualcomm's Snapdragon 845 64-bit Octa-core processor with an Adreno 630 GPU. It has a 6GB RAM and 64GB built-in storage which can be expanded up to 2TB via microSD. The ZenFone 5Z is powered by 3300mAh battery that supports BoostMaster. It also has "AI Charging" technology which charges the device to 100 percent before a user wakes up once already adjusted the sleeping schedule. Pros: Beautiful ultraslim bezels, AI charging, Wide angled dual-cam, Latest Qualcomm Snapdragon 845. Cons: Not Dust and Water Resistant. ASUS is considered one of the brands that successfully entered the Philippine mobile market and attracted multiple people with their different ranges of products being offered in the country. The brand vast line of phones for each type of smartphone users with easy to afford flagships that have lower prices than other premium devices. Their new flagship which is the ZenFone 5C looks promising, well-equipped and has an attractive price. I love it, price is right. Ito naba ang pinaka bago sa mga Asus phones? o meron pang iba namas latest pa?